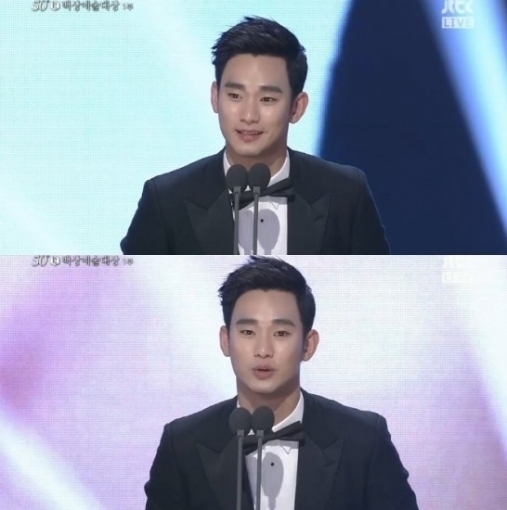 Kim Soo-hyun won the best new actor award in the film segment of the 50th LF Baeksang Arts Awards at the Grand Peace Hall of Kyung Hee University in northeast Seoul on Tuesday. Kim was nominated for his performance in “Secretly, Greatly (2013),” beating out Kim Woo-bin, Yeo Jin-goo, Lee Joon of MBLAQ and Yim Si-wan of ZE:A, who starred in “Friend: The Great Legend (2013),” “Hwayi: A Monster Boy (2013),” “Rough Play (2013)” and “The Attorney (2013),” respectively. The annual awards ceremony has been hosted by IS PLUS Corp., publisher of Ilgan Sports, since 1965. The award ceremony recognizes outstanding achievements in Korean film, television, theater and other segments of the entertainment industry.